← There’s no going back now! -I’m not as good of an address-book-maintainer as I originally thought I was. And, as it turns out, having save-the-date recipients’ addresses is kinda important. Apparently knowing someone’s e-mail address, being their friend on Facebook or following them on Twitter will not be of benefit to the post office. -I’m glad I journal regularly (Yes, I really am that dorky.) and that I make myself write in cursive in it. Otherwise I would have completely forgotten how to pen those loopy letters. I still managed to mess up about, oh, 15 or 20 envelopes because I couldn’t connect a “g” and a “y,” or I wrote the wrong first name or because I stumbled over Polish last names with lots of “z”s. -On a related note, I have completely forgotten how to make a cursive uppercase Z. My apologies to all my early elementary school teachers. -On another related note, I’m really glad we decided to get a personalized return address stamp. One address per envelope was a tall enough order. 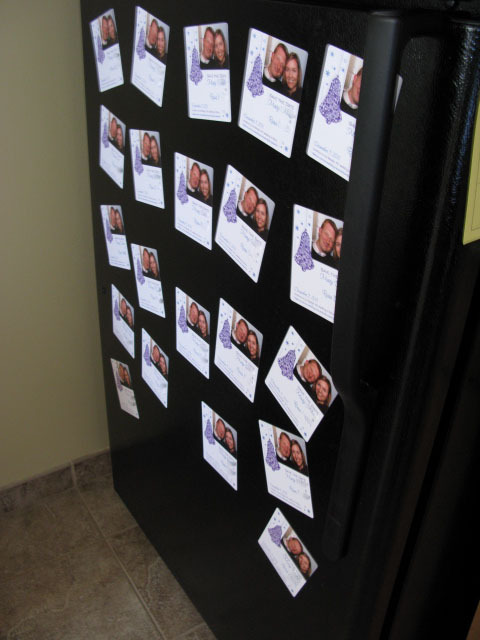 -If you order more save-the-dates than you actually need, you get to plaster your own refrigerator with your smiling mugs. This entry was posted in Uncategorized and tagged save-the-dates, wedding. Bookmark the permalink.